In 1950, the troubled Welsh poet Dylan Thomas ventured to New York City to read at universities around the country. The man who made this possible was a professor called John Malcolm Brinnin. His account of this time, titled Dylan Thomas in America has formed the film ‘Set Fire to the Stars’, directed by Andy Goddard. 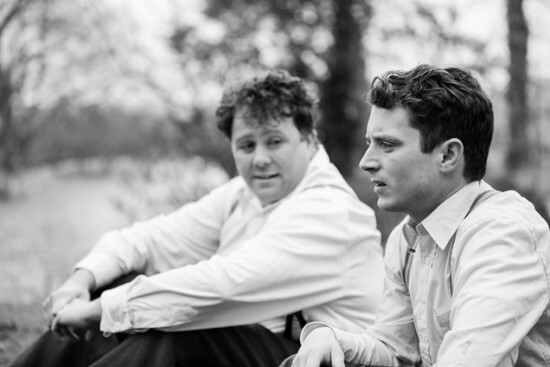 Elijah Wood and Celyn Jones star as Brinnin and Thomas respectively. Filmed in glorious black and white, the story explores their friendship and Brinnin’s struggle to understand and tame Thomas’ whirlwind lifestyle as he spirals out of control. The stylish, often snowy, city backdrop is presented impeccably, the clean and slick cinematography suitably matches John’s pristine appearance but clashes with Dylan’s haphazard existence. Initially, after an excellent opening sequence, it seems as though Brinnin, who is an obvious admirer of his work, is using Thomas for his own personal gain, but as he peels back the layers of his complex individual, he soon cares for and befriends the tortured soul. Dylan deflects attention to his talent by causing controversy and making lewd remarks, including reciting inappropriate yet amusing limericks. The performances though, of the poetry itself, are electric. Despite their differences, they share the odd moment of togetherness and acknowledge the mutual respect they have for one another. A scene in which they pull an all-nighter to grade student’s work is majestic, as they discuss language over coffee and cigarettes. The mise-en-scène showing the passing of time is poetry in motion. Wood and Jones perform very well, and bring the necessary charisma and energy to their roles. An impressive supporting cast including Shirley Henderson, Kevin Eldon and Kelly Reilly is solid, and their characters are involved in carving out the personas of the two leading men, showing other facets of their deep personalities and hinting at their complicated pasts. ‘Set Fire to the Stars’ illustrates the fact that you don’t have to be a musician to live the rock and roll way, and Dylan Thomas is proof of that. In the city that never sleeps, he enjoyed an excess of fatty food, red eye liquor and feisty women while Brinnin cleaned up the mess he left behind. This is an enjoyable, and informative biopic with an excellent display of acting that sheds some light on the man behind the words of wizardry. Dylan says to John in one scene whilst dissecting his poetry that understanding is the least important thing, and that feeling the emotion behind it comes first. Perhaps the same could be set for him as an artist and his life, and this adaptation certainly feels satisfying. This entry was posted in DVD and tagged andy goddard, celyn jones, elijah wood, set fire to the stars. Bookmark the permalink.